Hands-On Report: Apple Thunderbolt-FireWire Adapter--How fast is it? My mid-2011 11" MacBook Air has 2 USB 2.0 ports and a Thunderbolt port (see my review). The Thunderbolt port is for very high data transfer speeds of up to 10 Gb/sec on each of two channels. 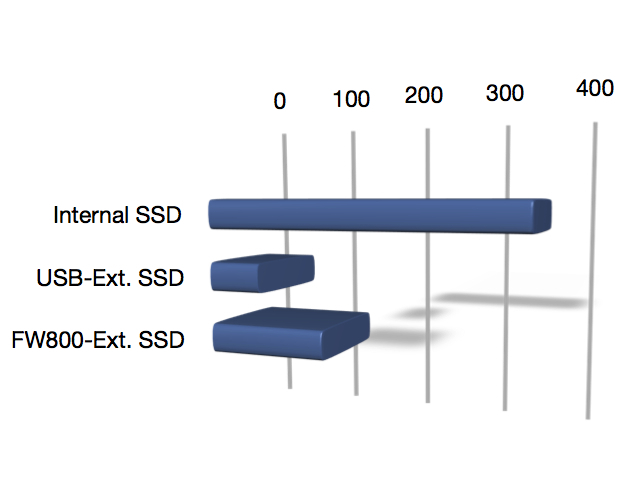 File transfers over USB 2.0 are relatively slow at up to 480 Mb/sec. But after more than a year, only a few Thunderbolt peripherals have hit the market yet and all are relatively expensive. I use an OWC 120GB Solid State Drive (SSD) in a USB 2.0 case to mirror my Air's internal SSD just in case it ever goes out when I am traveling. Apple finally began shipping its $29 Thunderbolt to FireWire Adapter so I ordered one and it arrived yesterday. FireWire 800 supports a transfer speed of up to 800 Mb/sec but, in practice, it is actually about twice as fast as USB 2.0. 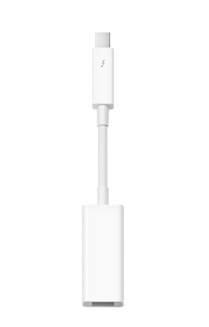 The Apple Thunderbolt to FireWire Adapter (see right and below, courtesy of Apple, Inc.) is very similar to the earlier-released Apple Thunderbolt to Gigabit Ethernet Adapter and the original USB to Ethernet Adapter. 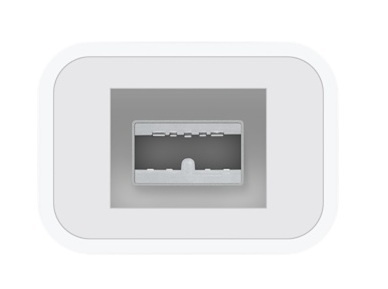 It has a 1" Thunderbolt connector, 2" of cable and a 1.75" adapter/FireWire 800 connector. One plugs the adapter into the Thunderbolt port on a Mac and connects a FireWire 800 cable that can then be connected to any FireWire 800 device. It produces 7w of power for bus-powered devices so no AC/DC brick or cord are needed. Blackmagic Disk Speed (test 1) shows the clear advantge of an internal drive versus an external drive with read and write speeds in excess of 200 MB/sec for the internal drive. The FireWire 800 adapter on the Thunderbolt port allows read/write speeds of 67/81 MB/sec, some 2.5 times the USB 2.0 port measured at 27/34 MB/sec respectively. 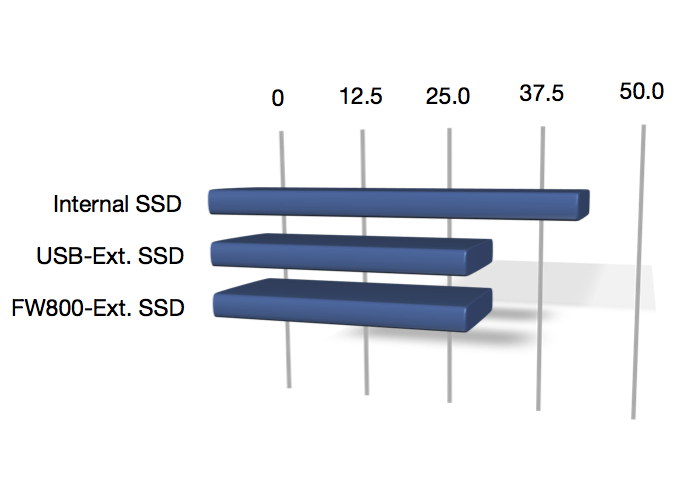 The Xbench 1.3 (test 2) results confirm those using Blackmagic Disk Speed Test, the internal SSD is almost 3 times faster that the external drive with FireWire 800 and the FireWire 800 adapter is nearly 2.3 times USB 2.0. 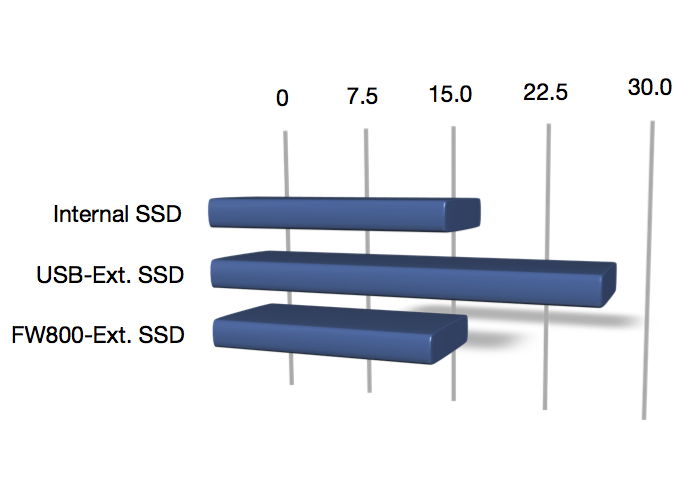 The speed of copying the 500MB folder of large files (test 3) is on a parity between the internal SSD and the external one using FireWire 800 which in turn is 39% faster than USB 2.0. The startup test shows that port speed has little to no effect on startup, with the FireWire 800 and USB 2.0 connections taking identical time. 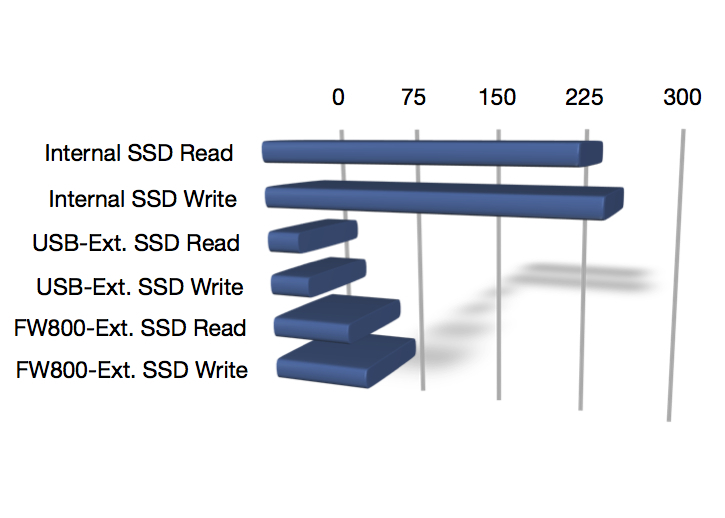 Both external connections were faster at startup than the internal one, illustrating that the aftermarket OWC SSD is faster, by at least 27%, than the stock SSD included by Apple in my MacBook Air. At 44 sec, my MacBook Air is much slower at starting up under Mac OS X 10.8 (Mountain Lion) than Mac OS X 10.7.1 (Lion) which took a mere 16 seconds.